Close up south east view of Bolton Priory in the morning in Yorkshire. A Priory of Augustine Canons were established here in c.1151 by Alicia de Romilly by transferring a community founded by her mother at Embassy. 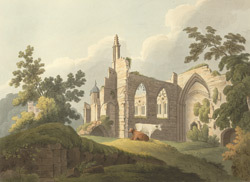 By the late 18th century, the ruined Priory had become, by marriage, the property of the Duke of Devonshire. It was considered by painters and poets to be a very picturesque ruin. The Priory Church was located on a bend of the River Wharf, in a rocky valley which lead up to moorlands. The wild northern landscape together with the gently decaying monastic ruins gave the place a distinctive charm. John Byng, Viscount Torrington visited here in 1792 and wrote 'The Vale is beautifully wooded, and water'd by the River Wharfe above which I rode till I arrived at Bolton Abbey; when I dismounted to survey the Abbey ruins, which are very magnificent.